We adopted Nelly from a no kill shelter in Meridan Ct two years ago. My 20 year old tuxedo cat had died earlier and I was looking for a replacement. A friend told me about an adopt-a-thon at the shelter so I drove 70miles to see if they had any cats. I was looking for a Tuxedo and they had one there but she was sharing the cage with 'her sister' who was all white. They were both about 9 months old. I asked if I could adopt the tuxedo and they told me that the two of them were inseparable and if I wanted one I'd have to take them both. They left me alone with the two of them and I sat with them both for about 10 minutes and decided I'd adopt the pair. I brought them home and we left them in our bathroom for a day to let them calm down. They were very nervous but the tuxedo started venturing out of the bathroom when I would leave the door open. We named our white cat Nelly because she was a nervous nelly. We've had Nelly for a couple years now and she is a wonderful cat. People say that white cats are lucky and I agree. We've had exceptional luck with all of our cats with two of our previous cats living to be 20 years old. I really hope that Nelly and her sister Josie are with us that long. Thank you for sharing your cat's story. Margret Victoria is such a regal name, I love it! White cats are so beautiful, I'm sure they think they are royalty like you said. 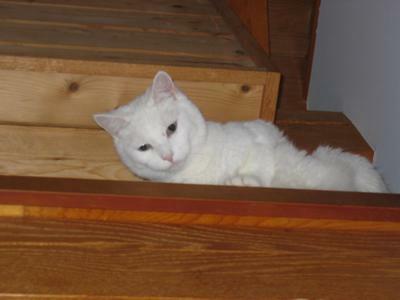 I will never forget the white cat I had when I was little. So far, I've never had another white cat save that one. I think you're quite lucky to attract such beautiful animals. My grandmother had a white persian cat. I was the only grandchild who could approach that cat and pick her up without hissing and claws. She was 19 when she died. I was as upset as my grandmother. Many years later, a friend of a friend, you know how it goes, told me that a kitten had been rescued from a car park. I, took this kitten into my home. She was a ball of white. I named her Margret Victoria. Well in her mind, she was royalty. She was totally deaf and lived to 15 years. I know have another white cat, one blue eye one yellow. He is not deaf. Loves the kids and is very loved. I believe I am destined to have a white cat in my life. I never seeked them out, they have just always entered my life. Spooky. A truly special species. Thank you for sharing Nelly's story. She's a beautiful kitty. She looks like a furry angel. I too adopted two cat siblings. I thought it was going to be more difficult than adopting just one kitten but in the end it was nice to have an "instant" cat family.